High Quality Content by WIKIPEDIA articles! 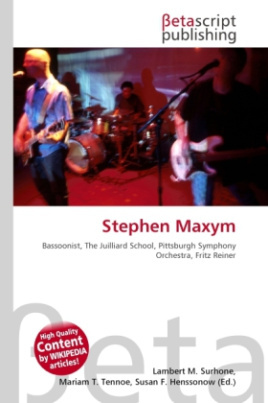 'Stephen Maxym (July 17, 1915 October 12, 2002) was an American bassoonist. Born in New York City, he attended the Institute of Musical Arts (now The Juilliard School) before Joining the Pittsburgh Symphony Orchestra as Principal Bassoon under Fritz Reiner. After serving in the United States Army during World War II, he auditioned for Erich Leinsdorf to become Principal Bassoon of the Metropolitan Opera Orchestra, a position he maintained until he retired from his active orchestral career. While at the Metropolitan Opera, he performed under many of the great conductors of his day, including Herbert von Karajan, Karl Böhm, Rafael Kubelík, Leonard Bernstein, Georg Solti, et al. He was also a distinguished teacher of both bassoon and chamber music, serving on the faculties of the Juilliard School, the Manhattan School of Music, the Banff Centre, and the University of Southern California, the New England Conservatory, the Yale School of Music, and the Hartt School of Music.